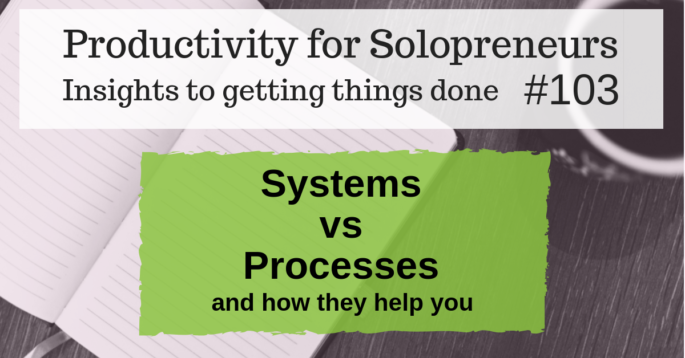 What processes and systems do you have in place for your business? You have them, even if you don’t know it! That’s one reason why today I decided to talk about the difference between processes and systems and how they work together. But when I Googled it to see if someone could define it clearly, I felt like I understood it less! Instead of defining it (and confusing us both!) I share some real-life examples in the video below. Last week was my 100th Facebook live! I did a Q&A and you can watch it by clicking here if you missed it. I’ve been thinking about the first question that was asked. Even if you haven’t recently started your business, you can probably relate to the question (I know I can). Decide what you’re going to do and stick with for a bit to figure out what works for you and what doesn’t. And I have more to say on this topic! 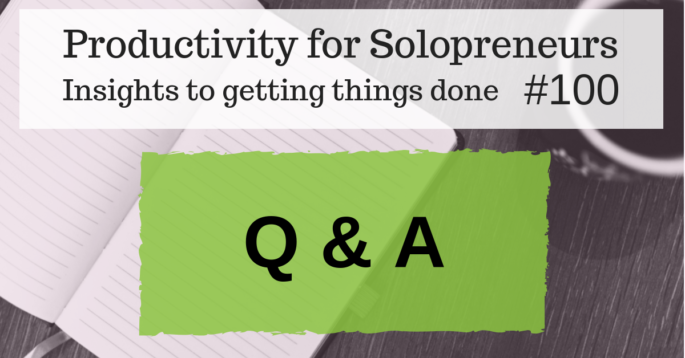 I’ll share it in this week’s Productivity for Solopreneurs: Insights to getting things done. You can watch it below.. In December of 2016, I was challenged by my coach to start going live on Facebook each week. I had lots of reasons (*cough* excuses *cough*) about why I couldn’t. But he helped me realize that I had even better reasons TO do it. It’s now over 2 years later and this is my 100th live video. To celebrate I’m doing a Q&A or you can think of it as an AMA (Ask Me Anything). (2:05) I recently started my business and am overwhelmed with how much there is to do! Some days I have NO idea where to start. I never feel like I’m making any progress. 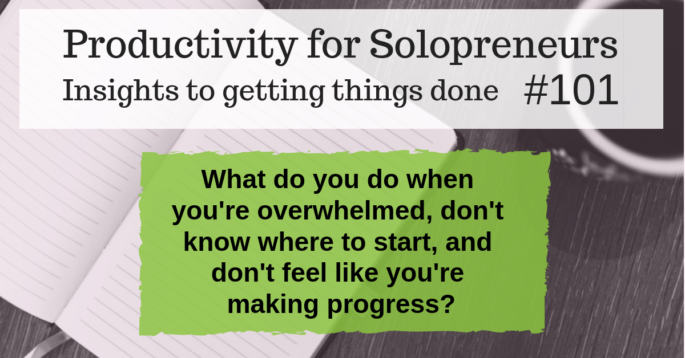 How do I manage everything without going crazy and start making progress? (7:38) When you’re just tired and don’t want to do anything, how do you get the motivation to get the things done you need to? (15:17) I didn’t keep up with my bookkeeping and accounts very well and now have HOURS of work to do before I can turn it over to my accountant. How do I prevent this from happening next year? In the video I mention the article where I reference my bookkeeping, click here for that. And you can find the Unnamed Productivity Club by clicking here. 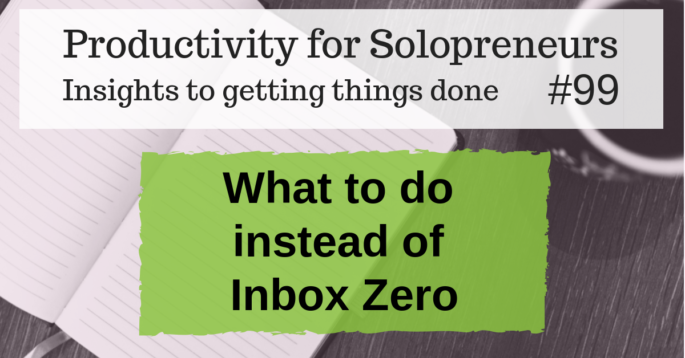 Last week I shared why you shouldn’t bother with the Inbox Zero strategy. This week I’m sharing what to do instead. The short answer is to find what works for you and keep doing it. But if it was that easy, no one would have an overwhelming inbox. Email clients have gotten a lot better about helping you manage your email. I know figuring out how to get your newsletters into Gmail’s Primary tab is a hot topic and many people worry about it, but those tabs keep my email working for me. Most email clients have some version of this (an email client is where you read and send email from, examples are Gmail, Outlook, Yahoo, etc.). For example, Outlook has a “Focused” and “Other” inbox. Use these tools to your advantage. If something ends up in a folder you don’t want it in, move it to the folder you do want it in. Most email clients want to keep you happy, so they learn pretty quickly that your Mom’s emails are important, but the emails from that clothing store aren’t. Having your email automatically sort your personal communications from the newsletters and business/store/sale updates makes quickly checking your email much easier. It’s the difference between a quick email check that’s actually quick and efficient and an email check that’s distracting because you have to manually sort through so much stuff and you feel like you missed something important. I have a Gmail inbox and I LOVE the tabs. But I don’t use them all the way that they’re intended. Primary – personal communications, including emails from clients. Social – Social media type and digest updates/emails (Meetup, Nextdoor, Instagram, Facebook, Quora, Goodreads, etc). Updates – Newsletters that I want to read a day or two after they’re sent, payment emails (Paypal, Square, Stripe, etc). Promotions – everything else. This tab is full of newsletters I get that I want to keep getting (although I keep an eye out for ones I regularly delete without reading and then unsubscribe from them). If I’m quickly clearing my email I’ll read the ones that catch my eye or if I have time I’ll open and skim each one. Forums – I don’t use this tab. Do you get emails from places that you’ve ordered from that you don’t want to unsubscribe from (because sometimes you do want to know about their sales), but their emails multiple times each week clutter your inbox? Create a “Shopping” folder and when you get an email that belongs in that folder, create or update a rule that sends emails from that sender to the “Shopping” folder. This way, you can open that folder every day or two and quickly scan for any emails that you want to open and delete everything else in that folder. This also keeps these emails from cluttering up other folders of your inbox. 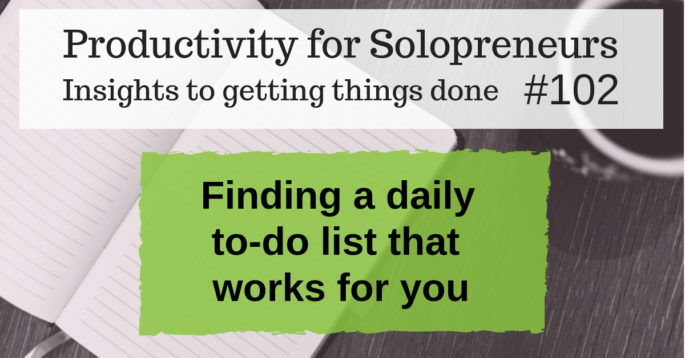 I’ll be talking about what to do instead of Inbox Zero on Wednesday at 1pm CT for this week’s Productivity for Solopreneurs: Insights to getting things done. I’ll be live on Facebook talking about this on Wednesday at 1pm. The video event is below.